Indian National Congress is known as the oldest political party of India. This political party that has completed its 122 years was established in 1885. This great & the oldest organization, at the time of its establishment had a great challenge to free India at the same time after independence i.e. after August 15, 1947; this organization has to bear the responsibility to run the democratic government of free India. In the beginning era of the Congress, the leaders like Anne Besant, Surinder Nath Benarjee, Sir Hume & Mahatma Gandhi gave a lead & patronized it & after the freedom, the Congress was patronized by the great leaders like Pundit Jawaharlal Nehru, Sardar Vallabh Bhai Patel, Maulana Abul Kalam Azad, Rafi Ahmed Qidwai, Captain Shahnawaz Khan, and Lal Bahadur Shastri & Indira Gandhi. The Congress that got fame all over India because of its secular policies in the country that has unity in diversity. The Congress remained at Centre in power for most of the time. Once it was a time, when most of the states in India were governed by the Congress. But today the condition of the Congress has changed because of many ups & downs. Today, the Congress is being led for the last ten years by Sonia Gandhi, widow of Rajiv Gandhi. It is because of the efforts of Sonia Gandhi that the Congress party is the major constituent of the UPA government that is ruling the country & the Congress Party is ruling in many states. But if we have a look at the period that is after the death of Rajiv Gandhi & before Sonia Gandhi i.e. from 1991 to 1998, the position of the Congress was worse than it is today. This was the time, when there was nobody from Nehru Gandhi family to lead the Congress. Narsimha Rao who had himself retired from the active politics was asked to take oath as the Prime Minister, after the death of Rajiv Gandhi. This government of Narsimha Rao that completed its tenure of five years was accused of buying 4 parliamentarians of Jharkhand Mukti Morcha & by that way completing its tenure of 5 years. It can be said that since that time the Congress has been eclipsed. There was a war for chair among the Congress leaders from 1991 to 1998. But there was a group of the Congressmen that was loyal to Nehru Gandhi family & well understood the situation, was on try for seven years to persuade Sonia Gandhi widow of Rajiv Gandhi to take the reins of weak & crumbling Congress in her hands. She was requested to organize & strengthen the scattering Congress. 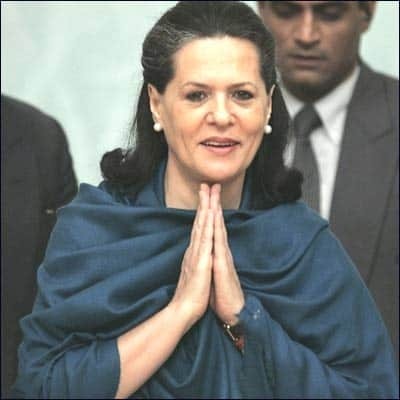 This wish of supporters of Sonia & well wishers of Congress was fulfilled on March 14, 1998 when Sonia Gandhi took charge of the Congress from Sita Ram Kesri the then president of the party. This was the time when many leaders of the Congress had taken shelter under other political parties & had left the Congress. During that time & even after that time, some much trusted leaders of the Congress alienated from the Congress. It is well said that prosperity makes friends & adversity tries them. Now the party had not been in good position. Now some party leaders were in trouble because Sonia Gandhi was president of the Congress & those leaders were thinking themselves the claimants of this chair & even of Prime Ministership. Some such leaders had forsaken the party. Such leaders made an attack by calling her a foreigner. It is the greatness of time that persons who called Sonia a foreigner have came again under her leadership & members of the constituent government of the UPA government & partner in the government. Today Sonia Gandhi is counted among the few powerful women of the world. On one side her opponents are attacking her by saying a foreigner & a Christian & on the other side; she is winning the hearts of the people because of her renunciation & sacrifice. It is time that Sonia has become the successor of Nehru Gandhi family’s attraction. That’s why a crowd of lakhs of people are attracted to hear this member of that family. The issue of leaving the Congress that has been going on far the last so many years has now stopped. The party has been organizing & strengthening itself in a better way. Taking a decision, as Indira Gandhi used to take; Sonia has also made her son, who is member of the Parliament, the general secretary of All India Congress Committee. In this way she has given a message to the Congressmen that successor of Nehru Gandhi family has come, who will take the fame of Congress to new heights. Despite it, Congress is unable to bring its lost popularity back in the Uttar Pradesh & Bihar. The Madhya Pradesh, Chhattisgarh & Gujarat are not under its control. In Rajasthan & Orissa too, the Congress is out of power. In Maharashtra, there is coalition government. Bengal has slipped out of the hands of the Congress for many decades. But the small states such as Haryana & Delhi are under its rule. What can be its reason? Why Nehru Gandhi family is unable to tell the people. What it wants? The Congress is the party that took credit of making the country free. This is a serious issue. Every Indian should understand it. Infact the Congress is that political party which talks of one India, one Indian, one Nation, one Nationality & one recognition from Kashmir to Kanyakumari. The Congress party has a base of religious harmony, unity in diversity & communal harmony. If we look at it from the view of country’s good, then this thought, this policy should be adopted by all the political parties. But it is a matter of sorrow that this is not the real position. Most of the political parties of the country are playing the politics of religion, caste or community. They also made region, language or groups as the base of their politics. They are polarizing their votes & dividing the Indians. The regional leaders that have been adopting such inferior tactics are, unfortunately, gathering strength. They teach the lesson of regionalism to the voters of their region & not of nationality. Obviously the Congress party doesn’t adopt such mean & inferior tactics, so it is going in loss. The inflation in day to day life is also playing a great role in deteriorating the condition of the Congress. At such points the common man who is being ground in rising prices is trying to avoid the Congress. Anyhow, the Congress is a great & old political organization that follows the policies of Gandhiji. In India as the politics is under narrow vision, so the Congress party seems to be losing its ground but whatever the present position of the Congress is, all the credit for it goes to Sonia Gandhi. The political sacrifice that Sonia Gandhi showed by refusing to take oath as the Prime Minister is the rarest example not ever seen in the world. It is hoped that if Congress succeeds in controlling the rising prices, then probably it can, by following the policies of Gandhism, once again touch the brilliant future.